The tonal shift in Chrononauts #2 by Mark Millar and Sean Murphy will either have you on board for the long haul or looking for the exit. In Millar fashion, things get outlandish and while it's fun and even exhilarating, logic has been lost in time. Danny emerges in the middle of a tribal war in 1504 only to find that the factions are using modern military weaponry and equipment. Confused and frightened, Danny is brought to the king - Corbin Quinn. His buddy and the man he was sent to bring back from the timestream has not only been taking liberties with his chronosuit, he's been making a fortune with it. It turns out, Corbin has been busy for four years actually, jumping from one era to another accumulating wealth and paramours along the way. He's also been introducing technology out of time. Anything to avoid the sorrowful trappings of the present day. He's a player, he's popular and having a blast all to the chagrin of the folks back at mission command. He even convinced Danny to join him, turn off his tracking device and join the time-traveling party. And that's where things get messy. Here you have two "bros" and it's understandable they'd want to travel across the history of the world and be witness to it all but they're also men of science. So it's one thing to visit baby Jesus and party with Lucky Luciano or date a pre-Marilyn Monroe, Norma Jean Baker but to do it on a whim, a fleeting joyride through time and space, for personal gain and enjoyment just seems meaningless. What becomes of the future when there's fighter jets in the Jurassic period or tanks in feudal Japan? How is the future not altered? Danny and Corbin certainly don't seem very concerned with how their actions might have negative consequences. It all rings hollow when it's all about fits and giggles for a pair of douchebags. 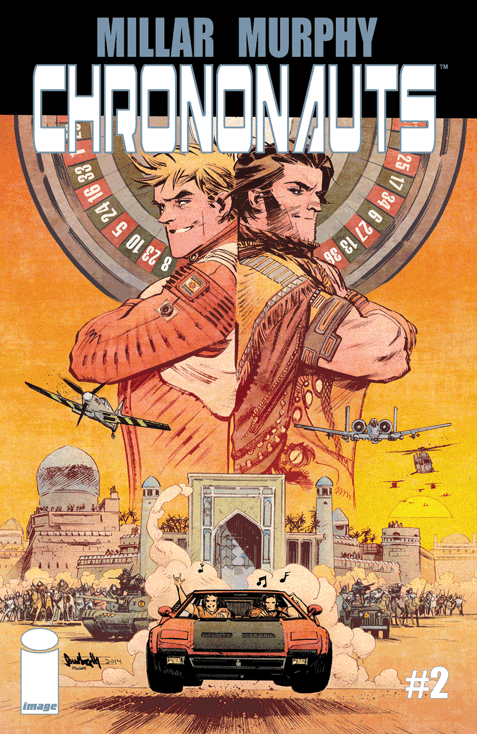 Despite the disregard for logic and the shallowness of the leads, Chrononauts is still a blast. You just have to turn off your brain and enjoy the madness. One of the benefits of such a crazy story is giving a talented artist like Sean Murphy the room to show off and create a montage of panels from throughout history. He's well adept at staging an era-appropriate scene with authenticity from architecture to costuming. Matt Hollingsworth's colors breathe life into each time jump with a subtle but effective palette. The art is top notch from beginning to end. Are the guys headed for disaster once the fun is over? Absolutely. You know they're going to pay somehow for going rogue and disrupting the timestream. Chrononauts may not make a ton of sense, but it looks great and might be worth the picking up if for nothing else to see these clowns get what's coming to them.